For the millionth time I must say I have one of the coolest gigs in the world. To be able to travel to fantastic golf vacation destinations like Cabo San Lucas, Mexico, for the purpose of reviewing world class golf courses, is a privilege I don’t take lightly. On my recent Hooked On Golf Blog World Tour stop to Cabo, I had the pleasure of playing Cabo del Sol, a Jack Nicklaus signature design course built in 1994. The course is ranked by many top publications in the top 100 in the world, as well as ranked #1 in Mexico. Part of what makes Cabo del Sol and the other golf courses in Cabo so great is the location. Los Cabos is located about 1,000 miles south of Los Angeles on the Baja California peninsula. That’s barely a 2.5 hour flight from Denver. The weather in Cabo is fantastic all year, averaging 78 degrees. There are 350 sunny days per year, meaning one could take 10 days break from golfing per year for other activities, like going to a spa. There are five sets of tees at Cabo del Sol. The longest playing set of tees (Black), measures at 7,091 yards. Slope from the back tees is 145 with a course rating of 74.4. In other words, the course is plenty of challenge even for scratch players or pros. One of the most dramatic parts of the course is the stretch from hole five green through hole eight tee. Hole five is ranked the toughest on the course, a 490 yard par-4. From there holes six (pictured above) and seven are back-to-back par-3’s on the sea. Absolutely fantastic stretch of golf. Carve this tee shot left to right. Try not to let the Sea of Cortez distract you! 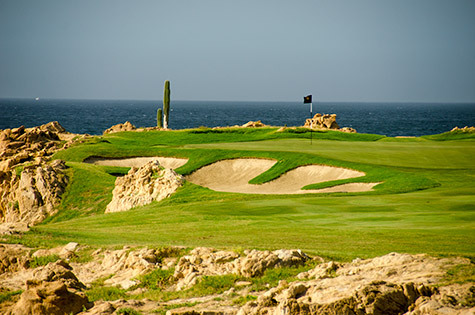 Teeing areas at Cabo del Sol are typical of desert target style courses. The tees are mini islands in the desert, framed by finely manicured desert foliage and large cacti. Many tee shots require some forced carries but nothing crazy. They’re completely manageable. Movement of the ball in both directions can help the player navigate the course from the tee and many tee shots tempt the player to hit driver when perhaps a more conservative play may be a better idea. Cabo del Sol’s fairways are much wider than they appear from the tee. The landing areas are spacious. Missing the wide fairways is possible though, and penal. Native desert areas are often the last resting place for a chance at par. Looking at the fairway and the Sea of Cortez as a pirate ship passes by in the background. Where else does this happen? Hitting approaches from the fairways can be a challenge. Stances can be slightly uneven, influencing shot lines which may be opposite what may be optimal. Approaching the greens at Cabo del Sol is challenging, Nicklaus style. Jack’s bunker complexes and design angles make approach shots the most critical shot on most of the holes. Proper approaches are the key to making par or birdie here. Not a bad green complex, if you like tremendous scenery. Click to zoom. The greens at Cabo del Sol are quite fun to putt. They’re large, with some very tasteful and fair undulations. Good reads and properly executed putts won’t produce any unwanted surprises. They’ll produce birdies and pars. The practice area is very well maintained with high quality range balls and cleaning stations. I was happy to hit the range before my round. The back was not happy. But after a few swings and loosening up in the warm Cabo weather, my back was back…so to speak. There’s a practice putting area right next to the 1st tee, surrounded by large cacti and beautiful desert foliage. Clubhouse as seen from #1 tee. Click to zoom. The 40,000 square foot clubhouse at Cabo del Sol is home to a well appointed and classy pro shop. The open air building also boasts fine dining, men’s and women’s lounges, lockers and meeting facilities. The service at Cabo del Sol was impressive, as has been my experience with just about every course and resort in the area. On the southern tip of the Baja California peninsula, customer service is as good as anywhere I’ve been. Cabo del Sol deserves all the accolades and awards it has received. The golf experience at Cabo del Sol does not disappoint. The facility has no weaknesses. From course design to amenities to course conditioning, throw in one of the best locations on the planet, the golf experience is tough to beat.